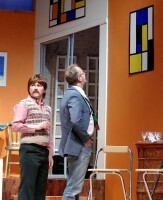 Alan Ayckbourn's Absent Friends, is a wonderfully entertaining comedy: even though its subject is grief. The English are notoriously bad at talking to the bereaved and hardly a line of dialogue in this play does not embarrass or hurt someone else in the room, yet it is very funny! 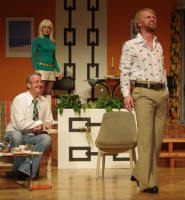 Ron Meadows' amazing 1970s set was outstanding, depicting a well-to-do suburban living-room - the setting for an excruciatingly uncomfortable reunion. Colin hasn't been seen by his old friends for three years; in the interim, two months ago, his fiancee, Carol, drowned. 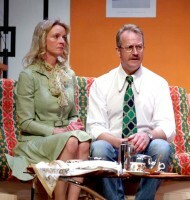 By the time he arrives we know that the marriage of Paul and Diana, whose house it is, is in trouble; that the monosyllabic Evelyn is not only the wife of Paul's business associate John but has had a brief affair with Paul; and that Diana's friend Marge is childless so treats her husband Gordon as a replacement. There is a great running telephone gag where the absent Gordon undergoes several disasters though confined to bed. Just as things are coming to a head.Colin arrives, radiating happiness absurdly at peace with his lot. This somehow has the effect of emphasising the others, deep seated problems - especially those of Diana who, stung by her husband's callous infidelity and the presence of Evelyn, eventually collapses in a weeping heap. The performances without exception were first class. Excellent work from Meg Dixon as Diana, trying so hard to put a brave face on things which leads, inevitably, to her total breakdown. 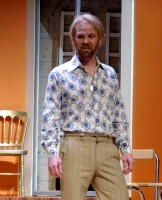 Fine performances too from Julian Cooper as the philandering Paul and Sean Baker as the jittery John. In the ladies' absence, the embarrassed silences between the three men were beautifully handled proving both uncomfortable and funny. It was good to see actors unafraid of making use of silences so well. Guy Holmes as Colin gave a wonderfully warm performance as he talked of his love for Carol and jollied everyone along with his reminiscences, blithely unaware he was just making things worse. The young and talented Fran Burgoyne's Evelyn was extremely well handled and I absolutely loved Sandra Birnie's portrayal of the dotty Marge which was priceless. 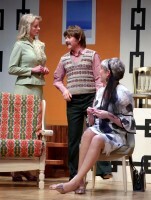 The furniture, props and costumes were spot on and so very right for the period. The lighting and sound (particularly the baby crying ) were first rate. 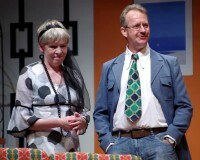 Director Nick Warbuton and his cast deserve all the plaudits which come their way for this excellent production. they start off with the best of intentions, but quickly it becomes apparent that Colin is the only one out of the group of old friends, who have gathered together for the first time in years, who doesn't have simmering issues and tensions that are bubbling to the surface and ready to explode. 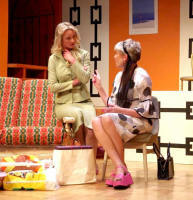 This Alan Ayckbourn comedy, was superbly performed by Bawds members under the direction of Nick Warburton. 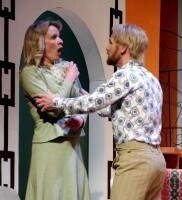 In particular, praise is due to Meg Dixon as Diana, the hand-wringing, anxious, overwrought yet empathetic wife of womaniser Paul (Julian Cooper) who neatly and cleverly captures a range of emotions. Her use of pauses and facial expressions, movement and stillness breathed life into the character, making her totally real, and someone you greatly sympathise with. 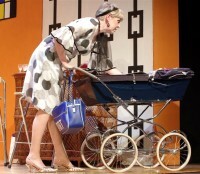 Part of the success of her role is due to a good supporting cast, from the monosyllabic Evelyn (Fran Burgoyne) to Sandra Birnie's hilarious and strong supporting role as Marge with her platform pink shoes, to the non-stop nervous or bored movements of Evelyn's husband John (Sean Baker). 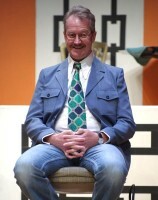 Guy Holmes as Colin seemed to ably capture someone who has loved and lost, and feels a stronger man for the experience. The strong cast of just six managed what many productions with more members do not always achieve. - to create both laughter and tension in equal measures. 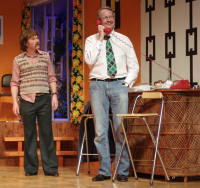 The set and costumes were excellent, credibly taking the audience back in time to the 1970s.